The second method is to print the document using the Microsoft XPS Document Writer. This has the advantage of being available in Microsoft Office System Visio 2003 as well as the later versions, however it does not export any hyperlinks. Neither of these methods embed any Shape Data/Custom Properties into the XPS document, and neither does the Microsoft export to PDF. However, XPS is extensible, and it could be enhanced to include data, but then the viewer would need to be developed to surface the data. Also, these XPS documents do not preserve any layering, which is a pity, but perhaps understandable, as Visio has a very complex layering system when compared to other vector diagramming applications. 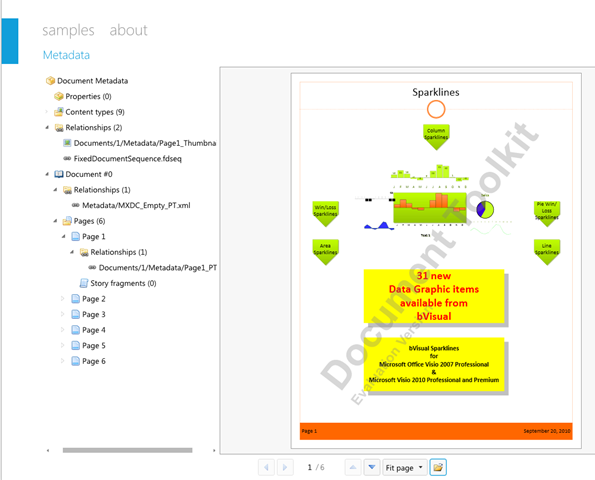 I should say that Adobe Acrobat is capable of creating PDF documents from Visio that display both data and layers. I have never understood why Microsoft did not / have not done this for Visio too in XPS. I know that Microsoft only export to the public open PDF spec, but they could make the effort for XPS. Hi David. I am a journalist for the above publication writing a series of articles on diagramming software in general and Visio in particular. Would you be happy to do a phone or email interview? I will naturally mention your book and your excellent blog.